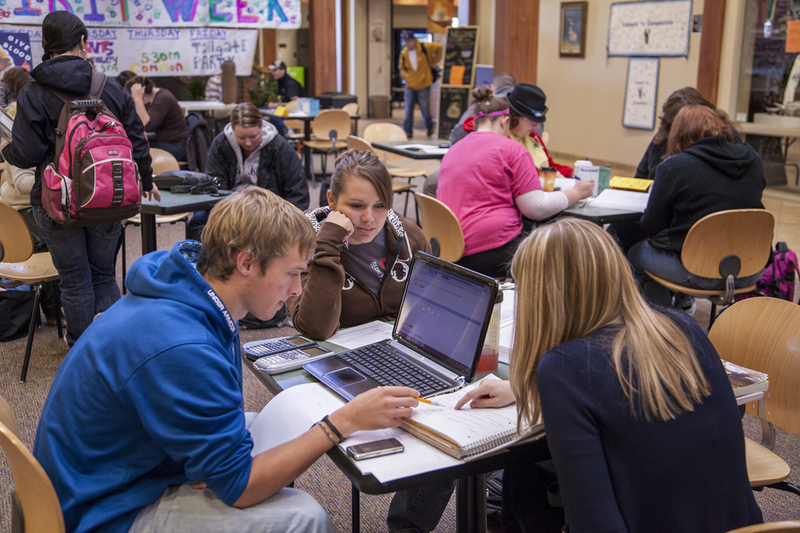 Become part of a collaborative, close-knit community at Gillette College. Our intimate campus is designed for you to make connections and better yourself for the future. Meet with new friends and study partners in our student lounge, enjoy convenient and affordable meals at our on-campus café and join a wide variety of on campus activities, clubs, teams, committees, and student government. A campus community can enhance your academic pursuits. Together, our staff and students strive to promote values of community, inquiry, integrity, and caring. There’s no better way to experience our values than to live on campus. Gillette College students can choose from two on-campus housing options, Tanner Village and Inspiration Hall. At High Plains Grill, located in our new residence hall, students will experience state-of-the-art food-court style dining. With multiple different food stations, offering everything from soup and salad to made-to-order Asian cuisine, the High Plains Grill is the place to be during meal time. The Gillette College campus has a continual cycle of activities happening each and every day. Get involved in a club. Start a new club. Take in a movie. Hang out down by the creek. All of this, and more, is waiting for you at Gillette College. The scenery itself is certainly beautiful, but it is meant to be enjoyed – and Gillette College has you covered. Whether you are looking to ski the nearest slopes or explore nearby hiking trails, you will find these and many more outdoor opportunities at Gillette College. Completed in 2016, the 55,867 square-foot Gillette College Pronghorn Center is a state-of-the-art facility that offers educational and activity space for all students. The Center houses Gillette College Pronghorn Athletics, flexible classrooms, a center for student veterans, the Health Sciences Simulation Laboratory, and a fitness center. Become a Pronghorn and cheer for our talented sports teams. Gillette College sports teams include Basketball, Soccer, and Rodeo. The Pronghorn Center provides students with an 1,800-seat athletic venue, a hardwood court, and a fitness center. Learn more about sports at Gillette College.